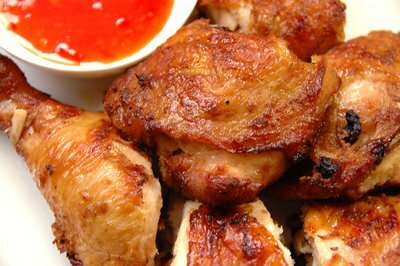 I found this recipe for Thai grilled chicken years ago, but I can’t remember where it came from. It’s incredibly good, even better than what you will find in most Thai restaurants IMO. Perfect with sticky rice. 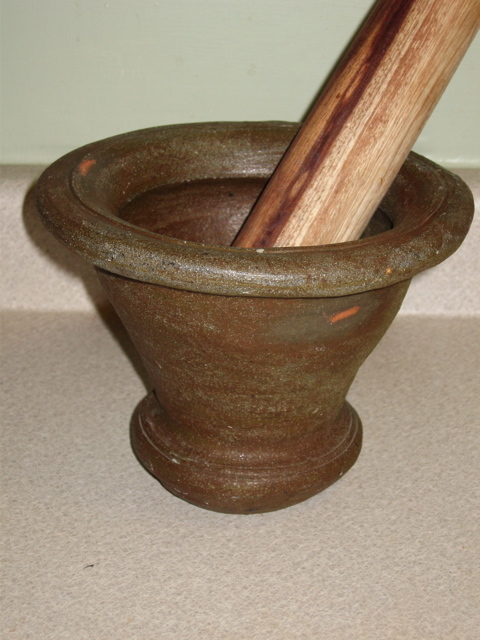 I like to use a mortar and pestle to make the marinade because I have a large one, like this. Otherwise, it's just as effective to use a food processor. Start by pounding the lemon grass, ginger, garlic and cilantro until everything is well mash. Transfer to a bowl and add the sugar, soy sauce and curry paste. Mix until you get a uniform consistency. How long to marinate? For chicken with skin and bones, I typically marinade for 6-8 hours. A whole chicken cut in half should go for about 8 hours. For boneless breasts, I pound them a little and marinate them for about 4 hours. This time I did chicken wings and marinated them for 5 hours. The best way to cook the chicken is to grill it. However, that only happens during the three months of nice weather here in Portland. I do thighs, drumsticks, and breasts on the grill, and during the other 9 months out of the year, I do whole (cut in half) chickens in the (convection) oven at 350º for about 50 minutes to an hour and chicken wings for about 35 minutes. The dish is not complete without the dipping sauce. Of course you can buy it, but it’s just as easy to make. Make it as sour or spicy as you like by adjusting the vinegar or sambal oelek. In a small saucepan, bring the sugar, water and rice vinegar to a boil. Reduce the heat a little and simmer for about 5 minutes or until it starts to get a little thick. Turn off the heat, add the fish sauce and sambal oelek (or chilies). Hey D, just give Oregon a few more years and soon you too will be grilling year round. I think I'll try just about all of these recipes this week,mmmm mmmmm good.